If buying new windows isn’t in the financial cards, you can at least seal leaky windows temporarily with clear, heat-shrink plastic film. It’s advisable to use this application on the window’s interior. Doing it on the exterior could trap moisture and compromise the sill. There are kits you can buy for under $10 that have just about everything you need. Follow the kit instructions, but in general, this is the routine. 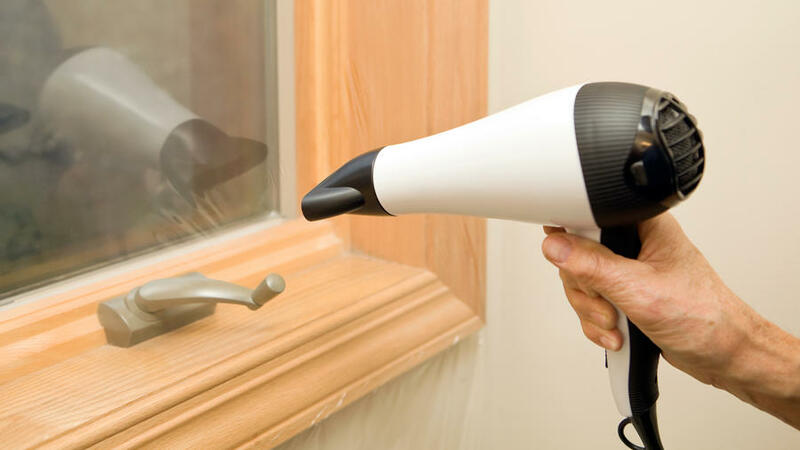 Clean the trim around your window with a solution of mild dish detergent and water to remove dirt and grease. If the trim is just a little dusty, try electrostatic cleaning cloths; oil-based cleaners won’t let the adhesive stick. Apply the double-stick tape around the outside edge of the window trim (not the face of the trim). Cut your plastic covering so that it’s 2 inches bigger than the window on all four sides. Remove the protective backing on the double-stick tape on the top edge and affix the film to it. Stretch the film along the sides and bottom. Then use a hair dryer to shrink the film. The heat should take out any wrinkles or creases, giving you a clear, transparent result.